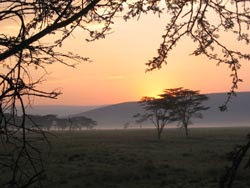 Had a morning game drive (see the stunning picture of sunrise at LNNP) before leaving Lake Nakuru and heading to Kisumu where our campsite was literally on the bank of Lake Victoria. Really just another day spent driving ... I'm noticing a frightening trend.